If "close to everything" matters to you, then consider buying a home in Meadowbrook. This popular east-side neighborhood had its best year since 2006 last year, and is currently on pace to have one of its best years going back 20 years. The reason for the recovery is low prices, and realistically this cannot last long, as homes are selling at a huge discount to their replacement cost, and that means investors are going to start swooping in to add these to their inventories. 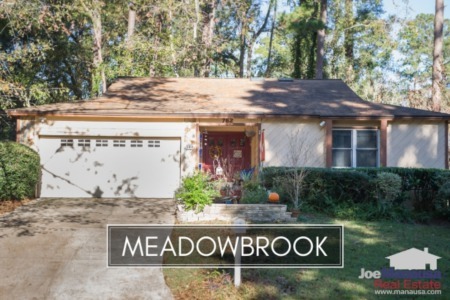 So the next time you are near the intersection of Mahan and Capital Circle on the east side of Tallahassee, you might want to cruise into Meadowbrook to check out all some excellent homes for sale priced just above $150,000. In this report, we will look at Meadowbrook home prices, home values, and home sizes, as well as the current listings in the Tallahassee MLS and all closed home sales going back to 1991. For the three real estate graphs found in this report, you will find the number of closed home sales for each year (red columns, measured on the left vertical axis), and an important real estate statistic shown in blue (measured on the right vertical axis. It is important to note that the analysis of the information that we provide is current through the second week of May 2015. Average home prices in Meadowbrook rebounded strongly in 2014 but have given it all back and more thus far in 2015. The average recorded sales price is $142,400 in 2015. The sixteen homes sold in Meadowbrook last year was the most sold in a year since 16 were sold in 2006. The current pace thus far in 2015 indicates we have a chance of even more selling this year, so expect to see higher prices before year's end. Average home values in Meadowbrook rose 2% in 2014, but have regressed 5% through mid-May in 2015. One might mistakenly believe that many of these sales have been distressed situations (short sales, foreclosures, bank owned properties), but this is not the case. Seven of the eight homes sold in 2015 were "arms length" home sales. In 2015, the average value of a home sold in Meadowbrook was been $90 per square foot, and that is a value that certainly cannot be replicated by a home builder. 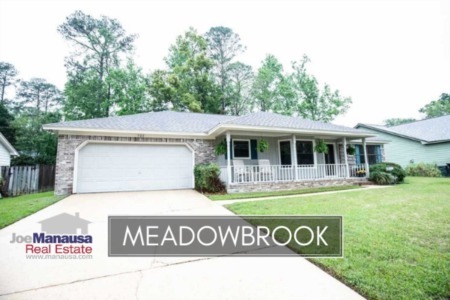 If you want a safe place to invest your money in a home in Tallahassee, you could do a lot worse than buying a home in Meadowbrook. The average home size sold in Meadowbrook typically falls in a range of 1,550 to 1,850 square feet, and this year has seen homes selling towards the smaller end of this range. I think just about everything that hits the market in Meadowbrook will sell this year (as they did last year), so the home sizes merely reflect what the inventory offered. Buyers are not choosing smaller homes in 2015, they are choosing everything. Thus far in 2015, the average size of the 9 homes purchased has been 1,578 square feet. The following list shows home sales going back to 1991 in Meadowbrook. I hope you enjoyed our May 2015 update on home sales in Meadowbrook, please feel free to drop me a note if you have questions not covered in this report.